The first Soviet atomic bomb, "RDS-1", was an implosion-type, like the U.S. "Fat Man" bomb, even in appearance; the front "eyes" are radar fuzes. The RDS-1 (Russian: РДС-1), also known as Izdeliye 501 (device 501) and First Lightning (Russian: Пе́рвая мо́лния, tr. Pérvaya mólniya, IPA: [pʲˈervəjə mˈolnʲɪjə]), was the nuclear bomb used in the Soviet Union's first nuclear weapon test. The United States assigned it the code-name Joe-1, in reference to Joseph Stalin. It was detonated on 29 August 1949 at 7:00 a.m., at Semipalatinsk, Kazakh SSR, after top-secret research and development as part of the Soviet atomic bomb project. It was later revealed that the USSR produced this device on stolen plans by Julius and Ethel Rosenberg retrieved in-part from Ethel Rosenberg's brother David Greenglass, and stolen directly from the Los Alamos National Laboratory and the Oak Ridge National Laboratory. The couple were later convicted of espionage and sentenced to Death. The weapon was designed at the Kurchatov Institute — at the time officially known as "Laboratory № 2", but designated as the "office" or "base" in internal documents — starting in April 1946. Plutonium for the bomb was produced at the industrial complex Chelyabinsk-40. 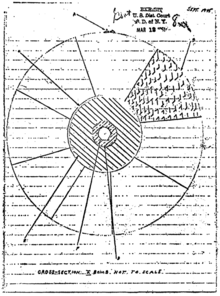 David Greenglass's sketch of an implosion-type nuclear weapon design, illustrating what he allegedly gave the Rosenbergs to pass on to the Soviet Union. This was later discovered to be part of the plans involved in the development of RDS-1. The RDS-1 explosion yielded 22 kilotons of TNT, similar to the American Gadget and Fat Man bombs. At Lavrentiy Beria's insistence, the RDS-1 bomb was designed as an implosion weapon similar to the Fat Man bomb dropped on Nagasaki, Japan; RDS-1 also had a solid plutonium core. The bomb designers had developed a more sophisticated design (tested later as RDS-2), but rejected it due to the known reliability of the Fat Man type design, the USSR having received extensive intelligence on the design of the Fat Man bomb during World War II. This was discovered in the espionage case of Julius and Ethel Rosenberg. In order to test the effects of the new weapon, workers constructed houses made of wood and bricks, along with a bridge, and a simulated metro in the vicinity of the test site. Armoured hardware and approximately 50 aircraft were also brought to the testing grounds, as well as over 1,500 animals to test the bomb's effects on life. The resulting data showed the RDS explosion to be 50% more destructive than originally estimated by its engineers. There are several explanations for the USSR code-name of RDS-1, usually an arbitrary designation: a backronym "Special Jet Engine" (Реактивный двигатель специальный, Reaktivnyi Dvigatel Spetsialnyi), or "Stalin's Jet Engine" (Реактивный двигатель Сталина, Reaktivnyi Dvigatel Stalina), or "Russia does it herself" (Россия делает сама, Rossiya Delayet Sama). Later weapons were also designated RDS, but with different model numbers. Mikhail Pervukhin served as the chairman of the commission in charge of the RDS-1 testing. Five RDS-1 weapons were completed as a pilot series by March 1950 with a serial production of the weapon that began in December 1951. Some United States Air Force WB-29 weather reconnaissance aircraft were fitted with special filters to collect atmospheric radioactive debris. On 1 September 1949, the Air Force Office of Atomic Energy had a WB-29 fly from Misawa Air Base in Japan to Eielson Air Force Base in Alaska. The plane collected some debris during this flight. These data were then cross-checked with data from later flights, and it was determined that the Soviet Union had effectively tested a nuclear weapon. The test surprised the Western powers. American intelligence had estimated that the Soviets would not produce an atomic weapon until 1953, while the British did not expect it until 1954. When the nuclear fission products from the test were detected by the U.S. Air Force, the United States began to follow the trail of the nuclear fallout debris. President Harry S. Truman notified the world of the situation on 23 September 1949: "We have evidence that within recent weeks an atomic explosion occurred in the U.S.S.R." Truman's statement likely in turn surprised the Soviets, who had hoped to keep the test a secret to avoid encouraging the Americans to increase their atomic programs, and did not know that the United States had built a test-detection system using the WB-29 Superfortress. The announcement was a turning point in the Cold War that had just begun. Once the Soviet Union was confirmed to be in possession of the atomic bomb, pressure mounted to develop the first hydrogen bomb. ^ Sublette, Carey (12 December 1997). "The Soviet Nuclear Weapons Program". nuclearweaponarchive.org. Retrieved 13 August 2016. ^ Kjelstrup, Christian (11 August 2013). "Dette er stedet der Sovjet testet atombombene sine". Dagens Næringsliv. Archived from the original on 14 August 2013. Retrieved 13 August 2016. ^ Righter, Rosemary (31 July 2002). "The nuclear guinea pigs". Archived from the original on 16 July 2007. Retrieved 13 August 2016. ^ a b c d e Peslyak, Alexander (31 August 2009). "Russia: building a nuclear deterrent for the sake of peace (60th anniversary of the first Soviet atomic test)". RIA Novosti. Archived from the original on 10 March 2012. Retrieved 13 August 2016. ^ Goncharov, German A; Ryabev, Lev D (2001). "The development of the first Soviet atomic bomb". Physics-Uspekhi. 44 (1): 71–93. Bibcode:2001PhyU...44...71G. doi:10.1070/pu2001v044n01abeh000875. ^ Bukharin, Oleg; Podvig, Pavel Leonardovich; Hippel, Frank Von (2004). Russian Strategic Nuclear Forces. MIT Press. p. 441. ISBN 978-0-262-66181-2. ^ Khalturin, Vitaly I.; Rautian, Tatyana G.; Richards, Paul G.; Leith, William S. (1 January 2005). "A Review of Nuclear Testing by the Soviet Union at Novaya Zemlya, 1955–1990" (PDF). Science & Global Security. 13 (1–2): 1–42. doi:10.1080/08929880590961862. ISSN 0892-9882. ^ Bukharin, Oleg; Kadyshev, Timur; Miasnikov, Eugene; Sutyagin, Igor; Tarasenko, Maxim; Zhelezov, Boris (2001). Podvig, Pavel, ed. "Russian Strategic Nuclear Forces". Cambridge, Massachusetts: The MIT Press. ^ "U.S. Intelligence and the Detection of the First Soviet Nuclear Test, September 1949". nsarchive.gwu.edu. Retrieved 18 April 2017. ^ Aldrich, Richard J. (July 1998). "British Intelligence and the Anglo-American 'Special Relationship' during the Cold War". Review of International Studies. 24 (3): 331–351. doi:10.1017/S0260210598003313. JSTOR 20097530. ^ a b Geselbracht, Raymond H. (ed.). "The Truman Administration During 1949: A Chronology". Harry S. Truman Library. Retrieved 13 August 2016. Wikimedia Commons has media related to RDS-1. 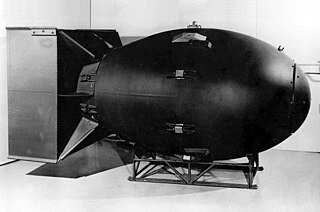 "Fat Man" was the codename for the nuclear bomb that was detonated over the Japanese city of Nagasaki by the United States on 9 August 1945. It was the second of the only two nuclear weapons ever used in warfare, the first being Little Boy, and its detonation marked the third nuclear explosion in history. It was built by scientists and engineers at Los Alamos Laboratory using plutonium from the Hanford Site, and it was dropped from the Boeing B-29 Superfortress Bockscar piloted by Major Charles Sweeney. Igor Vasilyevich Kurchatov, was a Soviet nuclear physicist who is widely known as the director of the Soviet atomic bomb project. Along with Georgy Flyorov and Andrei Sakharov, Kurchatov is known as the "father of the Soviet atomic bomb" and, later, "the father of the Soviet Nuclear Missile" for his directorial role in a clandestine Soviet nuclear program formed during World War II in the wake of the USSR's discovery of the Western Allied efforts to develop nuclear weapons. After nine years of covert development, as well as Soviet spies successfully infiltrating the Manhattan Project, the Soviet Union successfully tested its first nuclear weapon, codenamed First Lightning at the Semipalatinsk Test Range in 1949. In 1954 he was awarded the USSR State Prize in physics. This is a list of nuclear weapons listed according to country of origin, & then by type within the states. Atomic spies or atom spies were people in the United States, Great Britain, and Canada who are known to have illicitly given information about nuclear weapons production or design to the Soviet Union during World War II and the early Cold War. Exactly what was given, and whether everyone on the list gave it, are still matters of some scholarly dispute. In some cases, some of the arrested suspects or government witnesses had given strong testimonies or confessions which they recanted later or said was fabricated. Their work constitutes the most publicly well-known and well-documented case of nuclear espionage in the history of nuclear weapons. At the same time, numerous nuclear scientists wanted to share the information with the world scientific community, but this proposal was firmly quashed by the United States government. Project 596, originally named by the US intelligence agencies Chic-1, is the codename of the People's Republic of China's first nuclear weapons test, detonated on October 16, 1964, at the Lop Nur test site. It was a uranium-235 implosion fission device made from weapons-grade uranium (U-235) enriched in a gaseous diffusion plant in Lanzhou. The bomb had a yield of 22 kilotons, comparable to the Soviet Union's first nuclear bomb RDS-1 in 1949 and the American Fat Man bomb dropped on Nagasaki, Japan in 1945. With the test, China became the fifth nuclear power. This was the first of 45 total nuclear tests China has conducted to date, all of which occurred at the Lop Nur test site. Nuclear espionage is the purposeful giving of state secrets regarding nuclear weapons to other states without authorization (espionage). There have been many cases of known nuclear espionage throughout the history of nuclear weapons and many cases of suspected or alleged espionage. Because nuclear weapons are generally considered one of the most important of state secrets, all nations with nuclear weapons have strict restrictions against the giving of information relating to nuclear weapon design, stockpiles, delivery systems, and deployment. States are also limited in their ability to make public the information regarding nuclear weapons by non-proliferation agreements. George Abramovich Koval was an American who acted as a Soviet intelligence officer for the Soviet atomic bomb project. 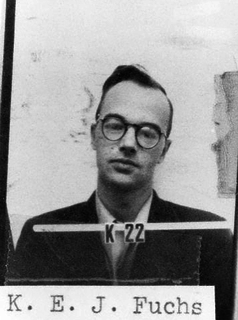 According to Russian sources, Koval's infiltration of the Manhattan Project as a GRU agent "drastically reduced the amount of time it took for Russia to develop nuclear weapons."